Close to a year ago I wrote about the changing nature of College Avenue. But that covered an area several miles long, so while some projects were close to each other, the sum of them was spread out over a fairly large area. Not so with the changes in Old Town. There are several significant projects underway with more that have been recently completed and even more somewhere in the midst of the development review process. Let’s take a look at what’s going on. 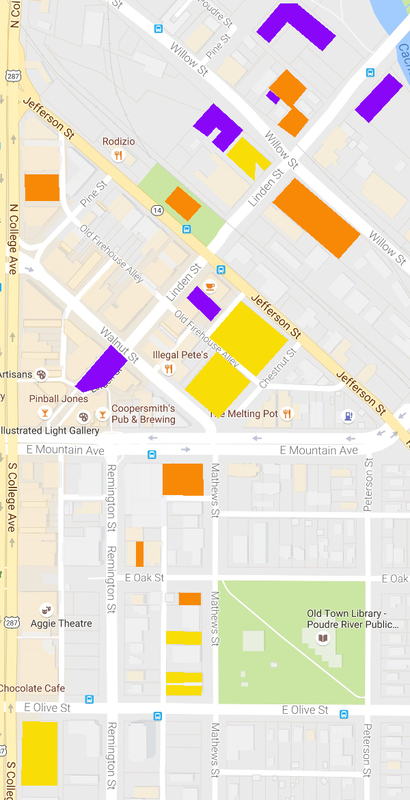 Purple indicates recently completed projects. Yellow shows projects currently in progress. Orange shows projects that have been proposed. The map above gives an overview of where the changes are happening. Not included is the nearly completed City Utility building on Laporte Avenue between Mason and Howes. The Otterbox building across from the Lincoln Center would probably also fall into the “recently completed’ time frame. And of course there are numerous multi-family residential projects along Mason, Howes, and Meldrum that are either in progress or recently completed. 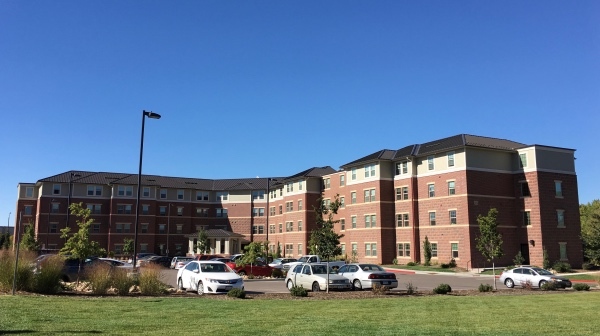 The Legacy Senior Residences were completed in 2014. The Poudre River Trail and the river itself are just to the right of this photo (and behind the building). Across Linden from the Legacy Senior Residences is Block One. Block One as seen from the bridge over the Poudre River. Block One was completed in 2015. 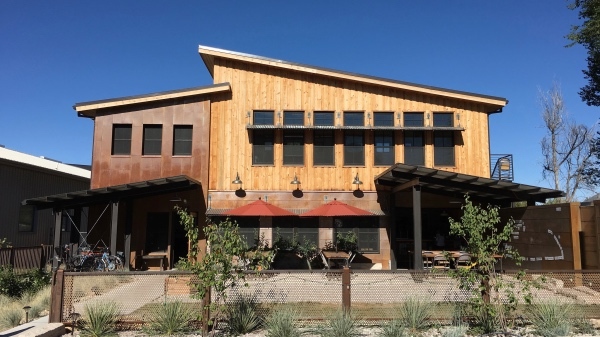 This 4-story building includes 11 apartments, a technology company, and space for a restaurant or event center. The Wolverine Farm Letterpress & Publick House is on Willow, between Linden and Pine. There used to be a small glass shop in this location and before it was a commercial property there was a small house in this spot. 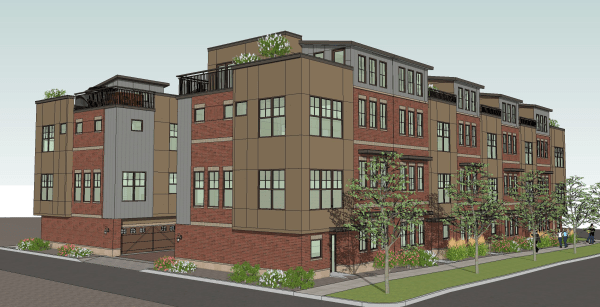 Right across Willow from the Publick House is a new apartment building containing 54 units of varying sizes. 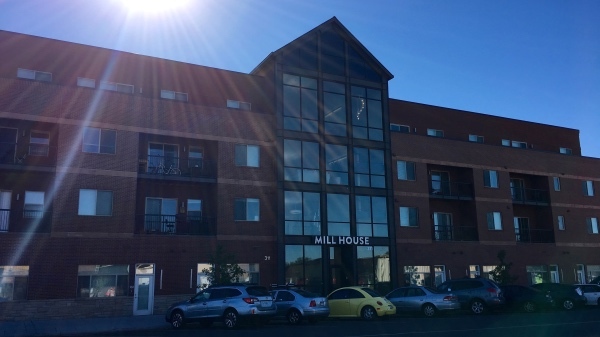 Both the apartments in the Mill House and those in Block One are touted as being high-end, luxury units. Galvanize is on the southeast side of Linden near Jefferson. This is a Google Streetview image. I have several photos of the work being done on the property but apparently haven’t taken one yet of the finished building. Heading further south-ish on Linden, there’s Galvanize, which isn’t exactly a new building, but I don’t think you can really call it a remodel either. It really looks and feels like a completely new place. The building has been through substantial changes from the early 1900s on through to today. The Sunset Event Center, among other businesses, used to be in this location. 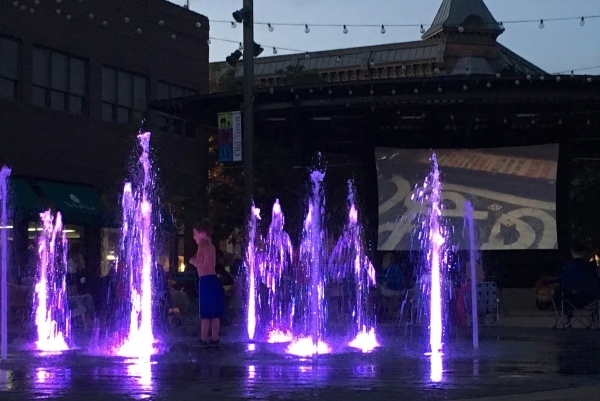 Old Town Square has been opened up to fit more people and a wider variety of activities. And the last of the completed projects is Old Town Square, which looks significantly different than it used to. 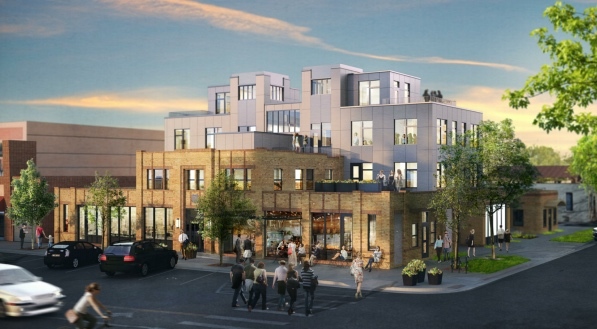 Ginger and Baker has broken ground at Linden and Willow. This image is from the Ginger & Baker website. As you can see from the above photo, the landmarked building will remain and a new structure will be added alongside it. The new building is triangular (much like the roofline of the historic building) and will sit respectfully away from the older building so it can still be viewed from the west side. 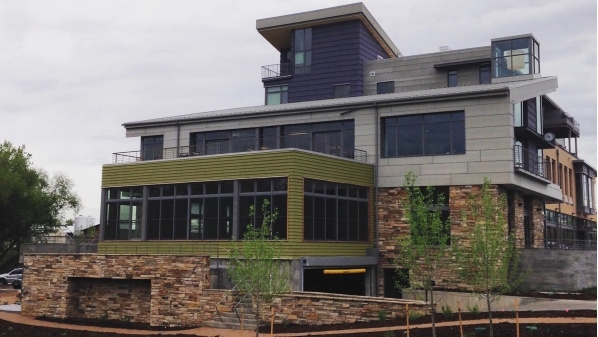 In fact, as guests sit on the patio or second story dining area, they’ll have a lovely view of the restored Fort Collins landmark. As we travel south down the map, we come to one of the largest development projects taking place in Old Town right now. It may not look like it in the image above (without any big rig trucks), but this is the view of what the new parking garage will look like from Jefferson street. Just behind and to the left of the SUV are what looks like store fronts. But that will actually be parking behind that facade. 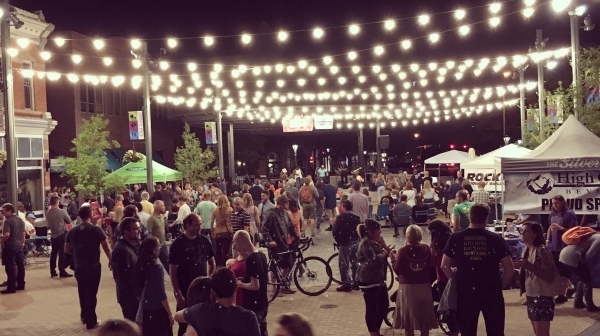 It’s built in such a way that if Jefferson becomes a more pedestrian street (such as if a highway 14 bypass ever becomes reality), the parking can be removed in that area and turned into commercial storefronts. According to the developers, this could be the site of another living wall, such as the one that’s been put on the new utility building on Laporte Ave. The parking structure would have space for a total of 350 cars. Though Firehouse Alley has not been improved between Linden and Chestnut yet, it’s planned to happen soon. Prost Brewing has recently moved in behind Illegal Pete’s and made some small improvements to previously vacant land there. So it looks like the alley could become as vibrant and busy as Linden or Walnut before long. The hotel will face Walnut and Chestnut with a step-down to the west in order to be respectful of the Old Town Historic District. It will include 164 guest rooms, 3,500 square feet of meeting/event space, and 3,850 square feet of restaurant/retail. It you head south from the hotel down Mathews street, you’ll come to an office building that’s replacing a dilapidated house built in 1869 (but that had not been well maintained over the years). Though you can’t tell from the front, the first floor of this office building will be almost entirely given over to parking. 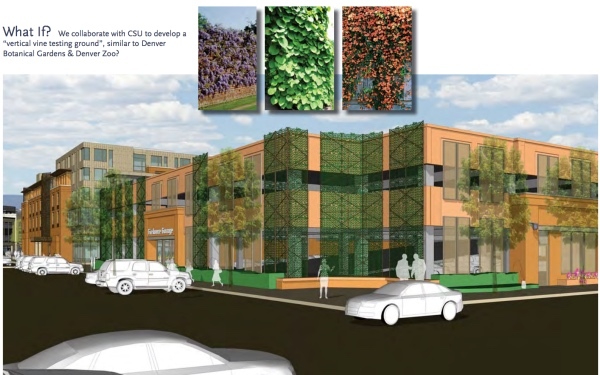 These images of the 3-story office building in context were taken from an LPC agenda. You may be looking at the above image and wondering what the oddly shaped buildings are on the Olive end of the block. Those are new town homes that are nearly finished being built at the corner of Olive and Mathews. If you’ve ever wondered why I decided to apply to be on the Landmark Preservation Commission, these town house buildings are the reason. Although the use of materials is fairly in keeping with the adjacent nearby historic structures, I feel the roofline in particular is not sensitive to the surrounding historic buildings — nor is the gap toothed streetscape created along Mathews (which would be appropriate in some parts of downtown, but not so much right here). Some simple changes could have been made so that these buildings would look and feel more like they belong in this location. But, it turns out, the LPC had pretty much no say on this project. So it’s not like I could have made a difference had I been on the team then. And I did write a two page report that I sent to both the developer and LPC at the time. So I still got my 2 cents in. The REA building used to stand at this site, and I believe before that Waterpik’s offices were located here. And the last project from the map above that’s currently under construction is a multi-use building called Uncommon. Named after a student housing project that CA Student Living built near the University of Oregon, Uncommon will include 150,000 square feet of overall space and rise 6-stories in height. After several iterations, the project has been carefully sculpted in front to be sensitive to the historic streetscape along College Avenue. 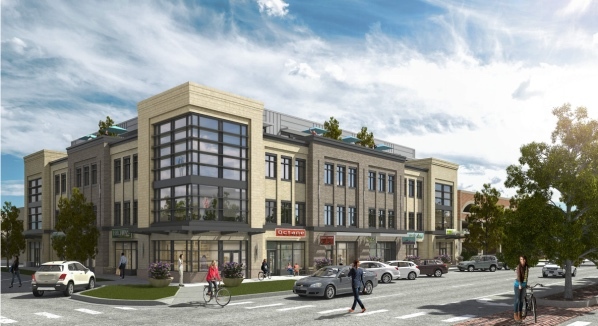 The building will have underground and street level parking accessed through the alley, 8,900 square feet of retail/commercial space, and 120 apartments including 248 bedrooms. This project was fairly controversial as it went through the development review process with the City. 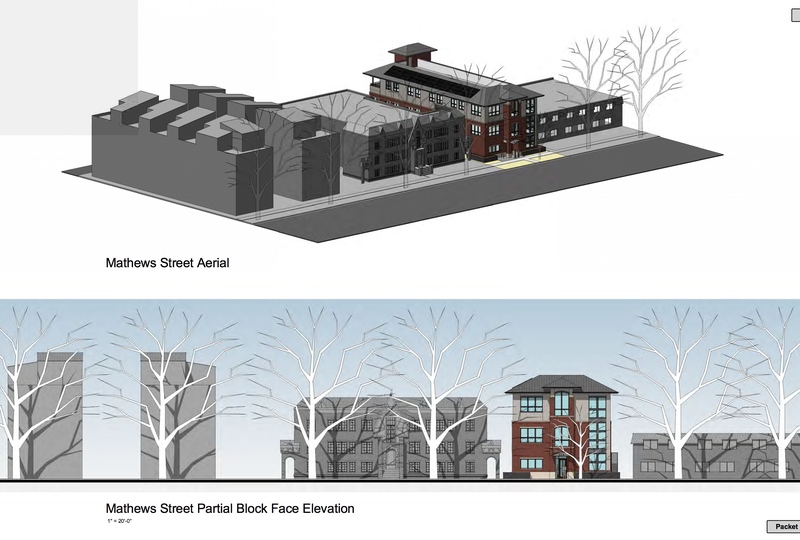 Although concerns along College Avenue were extremely well addressed, there was some apprehension over the effects of the massing along Olive Street and on the alley side of the project. 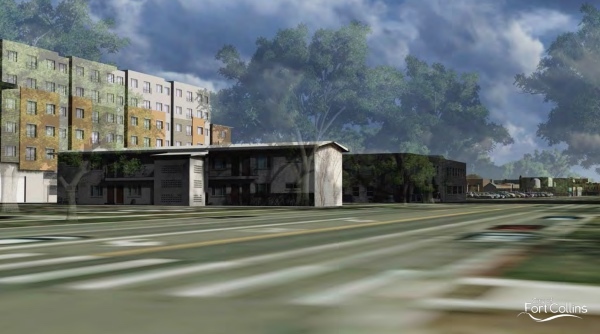 Toward that end, several mock-ups were created in order to better assess just how overwhelming the building might look and feel from Remington street and Olive Street. An aerial view illustration of what Uncommon would look like. The Armstrong hotel is at right. The project was not recommended by the LPC with a vote of 5-2 (If I remember correctly.) and it was recommended by Planning and Zoning with a similar vote of 5-2. (So it wasn’t unanimously agreed upon by either group.) It was appealed by a City Council member bringing the project before the City Council, which gave final approval to the project. And the Coloradoan had a field day, castigating the City staff and LPC while carefully only showing a front view of the project, the side that everyone agreed had been very well crafted to fit in well in that specific location, and omitting any reference to or image of the backside, which was the only part of the building at issue. There are still several more projects in the works. The orange blocks in the map above indicate anything from “the newspaper mentioned something might go in here” to “they’ve been in the development review process for years and seem to be sitting on the plans at this point” and everything in between. I’m not going to include images for all of these, but here’s a quick run-through of what might be up-and-coming. 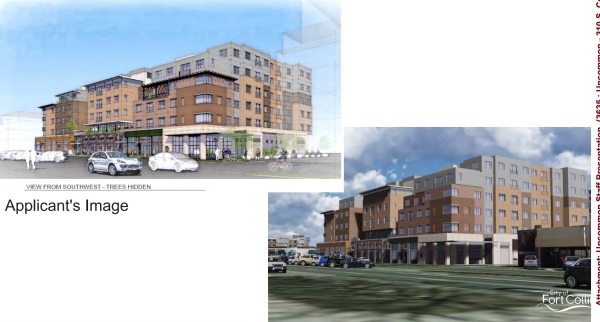 Retail and residential has been proposed at the north corner of Linden and Willow. 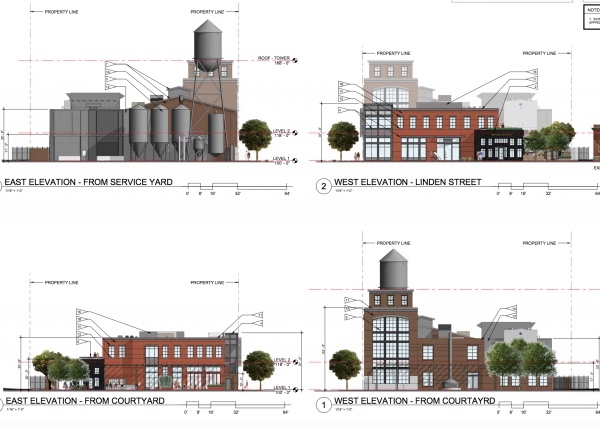 A distillery (with event space, retail space, and restaurant space included) has already been recommended for approval by the LPC at the south corner of the same intersection. Where Jefferson Park is today and where the Tedmon House once stood (a hotel and restaurant from Fort Collins’ earliest days that was torn down when the railroad came through) a restaurant has been proposed. 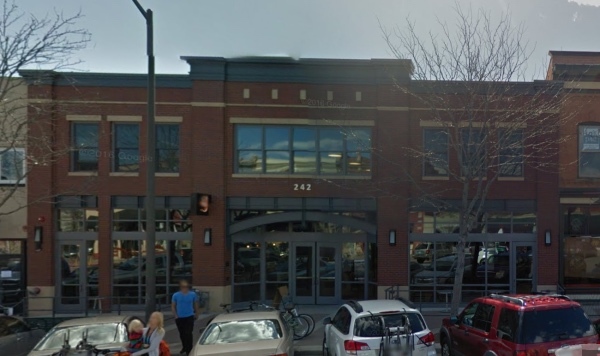 Little Man Ice Cream might be coming to Fort Collins. 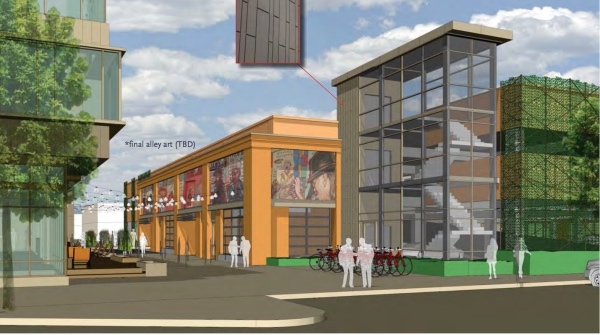 If they do, they’ll probably be located in that orange block right off N. College near the Pateros Creek Brewing Company and the now closed Compass Cider. From what I’ve heard, they may be changing up their classic building shape a bit. Be watching for more on that in the coming months. A new office building will be replacing a closed auto shop on E. Mountain. 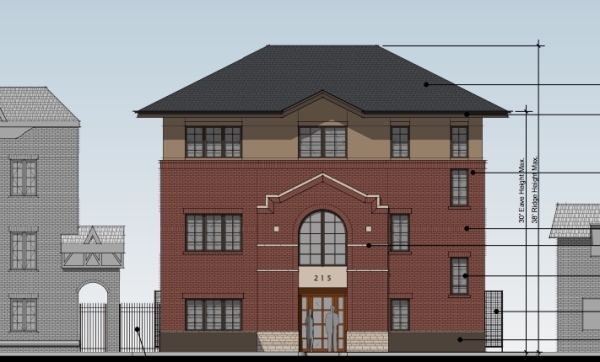 Proposed office building (with some retail) at 221 E. Mountain. 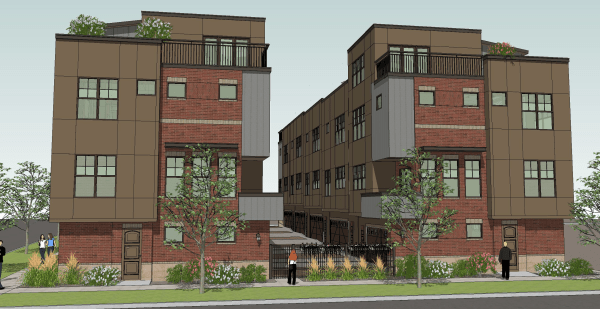 The proposed office building has already been recommended by the LPC and has received funding from the DDA (according to the February 18, 2016 Coloradoan), which means it might be getting underway fairly soon now. This project is being undertaken by a Michigan firm. Note the bicyclists again. At least this time it’s a bit more believable… though the gal in the red shirt should not be coming down off the sidewalk there. Not only is she wrong-way riding (which is legal on the sidewalk, so she’s alright in that regard, but it’s not very safe), but I’m guessing the dismount zone would be pushed out to include this block if it’s not already. … just sayin’. The Poudre Garage is a landmarked historic building. The new building will go into the parking lot behind it. The Poudre Garage is going to get some TLC as it’s renovated to make room for retail space as well as restaurant or cafe space. The new building behind it will include residential units and accompanying parking. And the last possible new development (that I know of) in this area could be happening in the vacant lot at the corner of Oak and Mathews. But I suspect that’s just a twinkle in someone’s eye at this point. Whew!!! That’s a lot going on in one small part of town. Already I look back to the article I wrote less than a year ago about proposed projects going in along College Avenue and most of the changes are complete or nearly so. I’m sure in a year or two, all of these changes in the Old Town area will likewise be history.